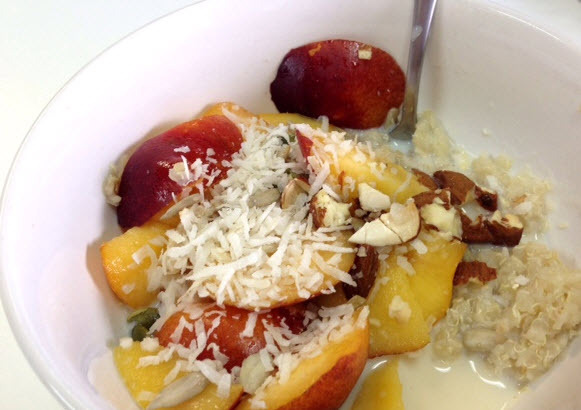 Breakfast Quinoa porridge with sliced Nectarines, roasted almonds, seeds and coconut. This is a fresh tropical tasting breakfast that is as filling as it is tasty! In this week before Christmas I decided to clean up my diet so I have set aside 4 days to eat really cleanly, removing Wheat, dairy, caffeine, Alcohol and meat from my diet. Thankfully my fiancé is on board as we have both been feeling a little sluggish. I/2 cup of quinoa flakes, cooked with 1 cup of water. A dash of soy/ almond or rice milk. This recipe is made with Quinoa flakes, You can get them from health food stores and even some supermarkets. My local Woolworths has them.Quinoa is a protein rich super food rich in Iron, amino acids and magnesium with a lower carb content than other grains or oats. To Cook the Quinoa you just prepare like you would a bowl of oats either on stove for 3 mins until they thicken or in the microwave for 2 minutes. Transfer into a bowl and top with chopped fresh Nectarine, shredded coconut, smashed Almonds and some sunflower seeds. Add a dash of Soy, Almond or Rice milk and there’s your yummy brekky! Its tropical, light, fresh and super tasty! In fact is so yummy I chopped up some nectarines again, added some coconut and almonds for a snack in the afternoon too..